Nasmyth Arden, a Solihull-based specialist in the manufacture of aerospace components, has purchased a SmartScope CNC 800 multi-sensor shop floor measuring system from OGP UK. The new machine has cut cycle times for certain measurement and inspection routines from 2 hours using Arden’s traditional CMM, to a just a few minutes. Established in 1980, Solihull-based Nasmyth Arden is currently enjoying a period of strong growth. The company machines sizeable aluminium aerospace components from billets, castings and forgings, and has seen current turnover reach £3.7 million. However, Arden expects this figure to reach £4 million by the end of the current financial year. The reason for the company’s success is plain to see. This is a progressive manufacturing business that has invested heavily in its future. The manufacturing area, for instance, is dominated by a host of CNC machine tools, including two Mikron HP1350 five-axis machining centres. And now, the company’s inspection equipment can match-up following the installation of an OGP Smartscope CNC 800 multi-sensor measuring system. Arden, which employs around 50 people, specialises in electronic and electrical control (EEC) cases that are designed to protect the ‘brains’ of an aircraft’s engine. These complex, prismatic machined parts feature hundreds of threaded inserts. As with almost all aerospace components, 100% inspection is an essential contract requirement. However, the job of checking for inserts proved laborious and was subject to human error. Smartscope CNC high specification shop floor measuring machines are designed to inspect components automatically, to the highest levels of accuracy, in the most hostile of environments. Multi-sensor deployment, including video, laser and touch probe, allows for unmanned inspection and high component throughput. The multi-sensor capabilities ensure that the CNC800 isn’t restrictive, but is capable of measuring any number of applications in the future. The OGP Smartscope CNC800 at Arden now undertakes the automated presence-checking of threaded inserts on all of the company’s large EEC cases, as well as inspecting for the unwanted presence of insert tangs. Furthermore, the machine performs extensive dimensional measurements. Previously, the company’s traditional CMM would have been used, but the time savings using the CNC800 were too good to ignore. To confirm the company’s belief in its new Smartscope CNC, Arden conducted a gauge R&R study soon after installation. The study was performed to determine that the machine was capable of measuring in-process checks in line with the aero engine control systems standard, ES-31-603. A 1-off part was measured 25 times against a set of four features: flatness to within 0.08mm; seal groove width of 2.01/1.91mm; depth of face to seal groove of 1.40/1.50mm; and the true position of a tapped hole calculated from its X and Y position to within 0.2mm. The report summary status simply reads “pass”. Quality is clearly paramount at Nasmyth Arden, which prides itself on strict quality control over every aspect of its production system. The company maintains ISO9002 and AS9100 Rev C accreditations. It is also a member of the Midlands Aerospace Alliance and is an ADS SC21 Bronze award winner for the past three years. Further impressing the company’s commitment to quality is its employment of apprentice inspectors, thus nurturing the next generation of talent. 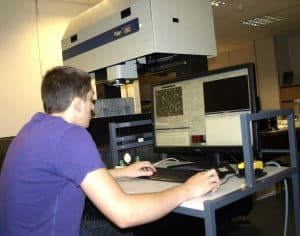 One such is second-year apprentice, Peter Stevenson, who is tasked with programming the Smartscope CNC800. At present, Nasmyth Arden deploys its video sensor for all inspection, profile and feature measurement. Here, a high quality, 12:1 zoom lens calibrates itself at every magnification change for consistent measurement accuracy. Innovative solid state illumination sources, a colour camera and Measure-X® metrology software make every CNC model a powerful video measuring system. In terms of multi-sensor capability, Arden is currently deliberating the addition of a touch probe to further aid 3D dimensional measurement.